While we aim to get outside for a chunk of the day no matter how cold it is, I completely understand that it isn’t an option for everyone and that there are plenty of hours in the day to fill! 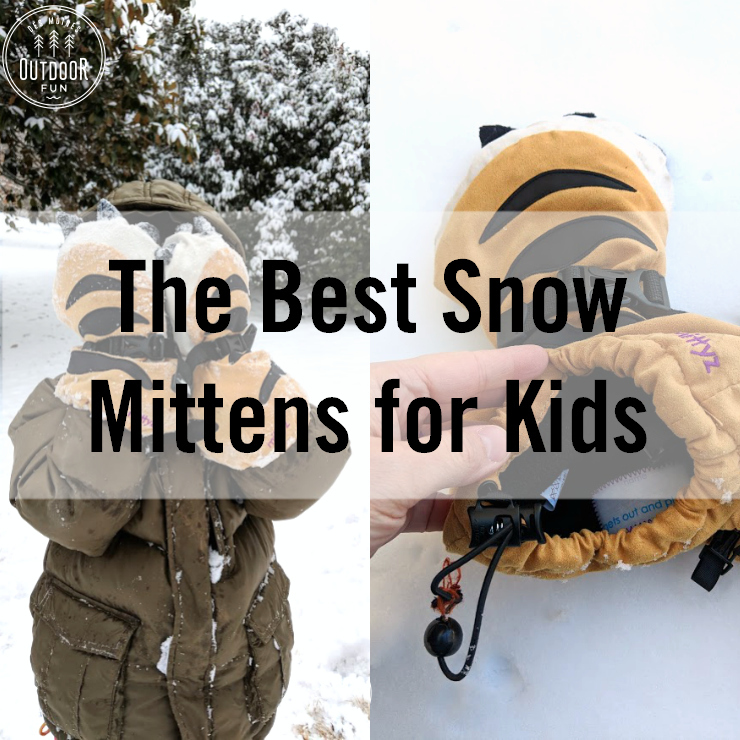 (See what we’ve been wearing to stay warm this past fall, in this post, for winter we add balaclavas and thicker down jackets!) I try to keep a few places in rotation that allow us to experience nature without wearing a million layers. I’ve rounded up a list of places that you can experience some element of nature while still staying inside, please let me know if I missed any that you can think of! Scroll to the bottom for a map of where all these places are located around the city. Want a challenge?! Download our Winter Challenge: Explore The Outdoors, Indoors! Enter in to win fun prizes! 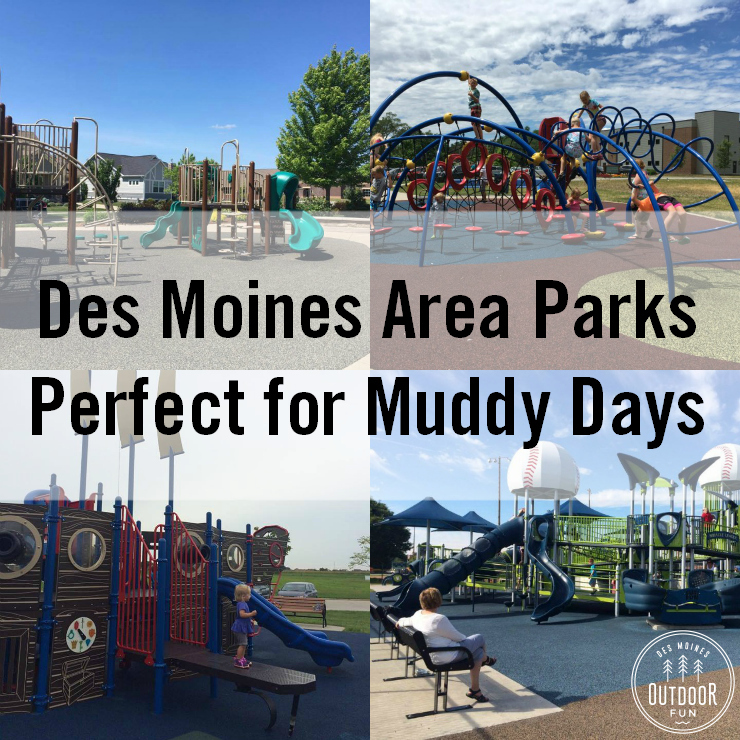 If you’re looking for indoor playground options, ways to expend energy indoors with gross motor play but not necessarily find nature, there are quite a few options that you can find in this post of places to play indoors around Des Moines, Iowa. If you combine these two lists with all of the local libraries, I feel like you have a pretty comprehensive list of where to keep kids entertained indoors. In no particular order, here are all the places we have enjoyed feeling outside or exploring elements of nature without actually being outside. 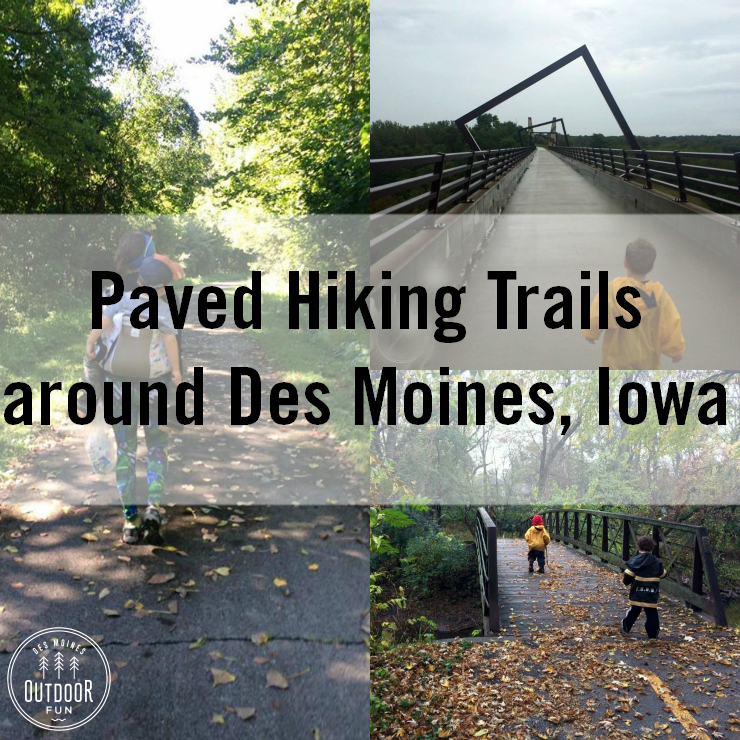 In 2018, I’m excited to add the future nature center at Jester Park to this list! 1. 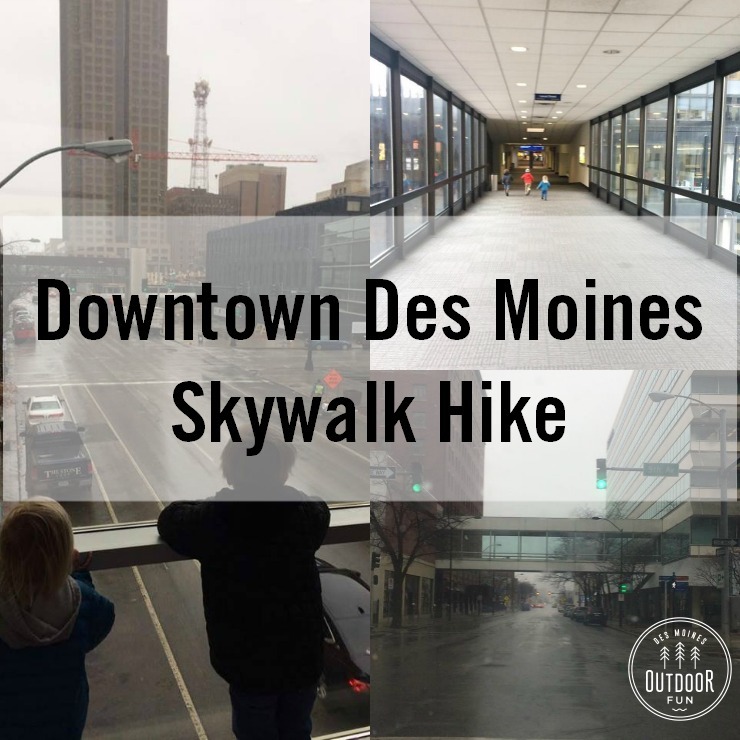 “Hiking” in the skywalks downtown – I’ve even heard reports of kids riding scooters and such in them, during off-peak hours but haven’t tried it ourselves! 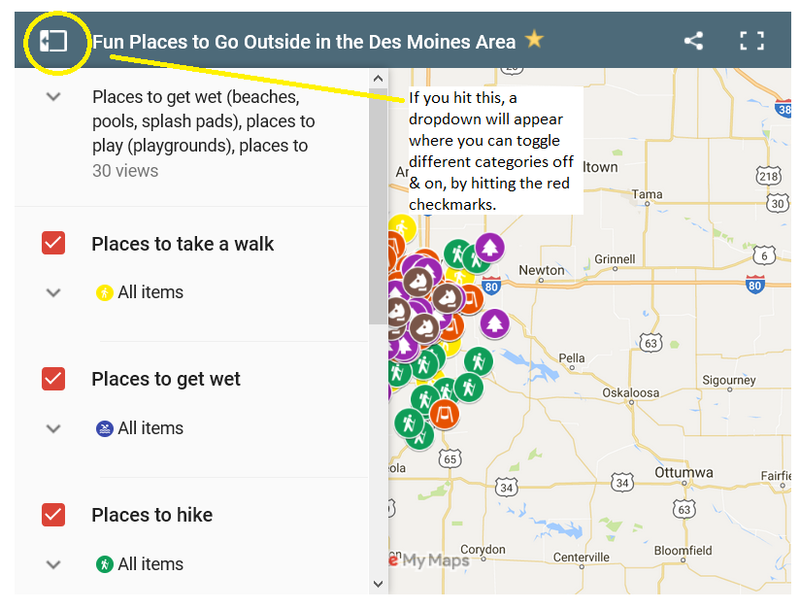 Click through to see where we parked and what we found; you can check out different trees, birds, and weather patterns while staying dry. Free! 2. 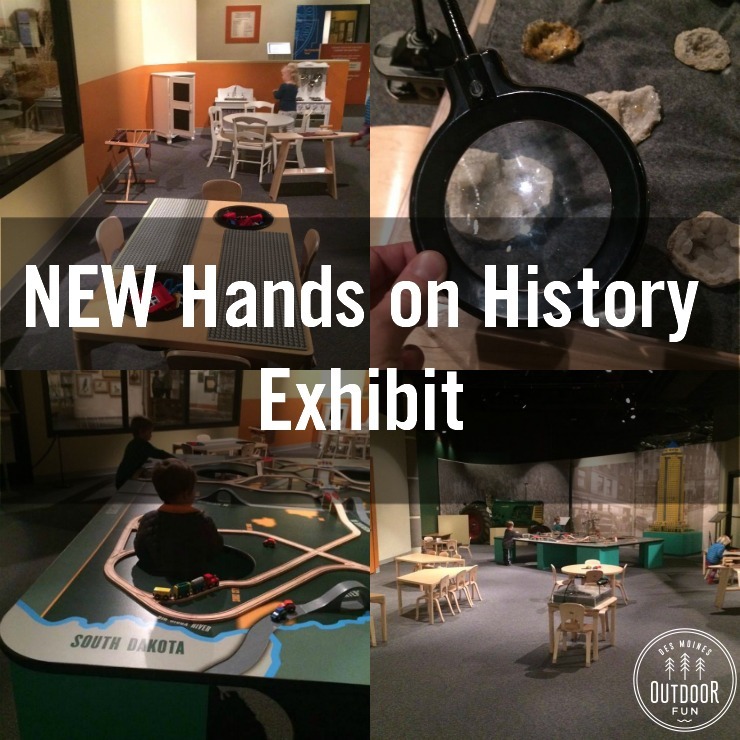 Visiting the Iowa State Historical Museum– Such a great, free spot with some cool leaf crayon rubbings, geodes, and nature-y books in the specific hands-on exhibit. There are also lots of taxidermied animals, and botany displays throughout the rest of the museum (and a mastodon!). Free! 3. 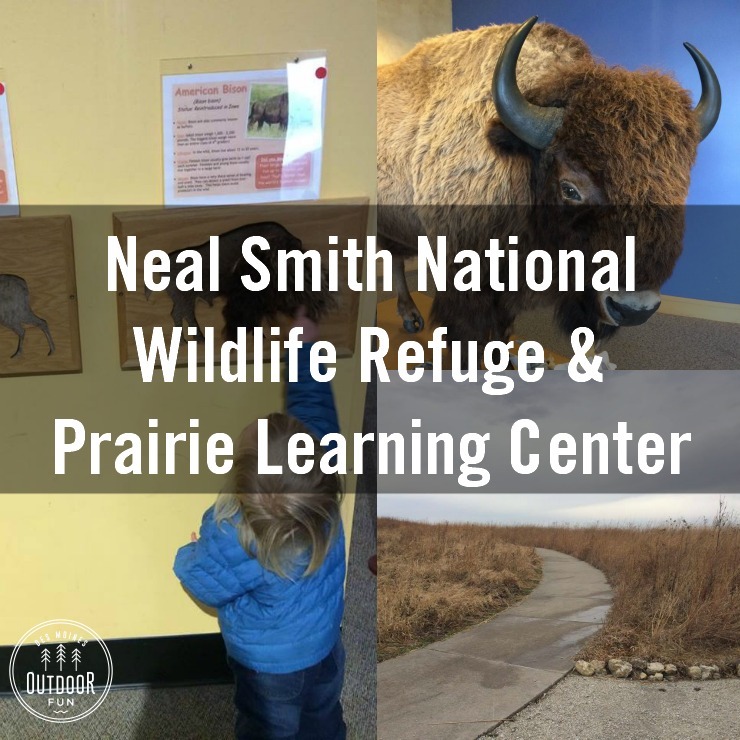 Prairie Learning Center at Neal Smith Wildlife Refuge – such an awesome place, with heaps of displays and interactive elements to learn about the prairie. You can drive through the buffalo enclosure afterwards, too! Free! 4. Greater Des Moines Botanical Center- the warmest option, this is a great place to visit when it is bitter cold. 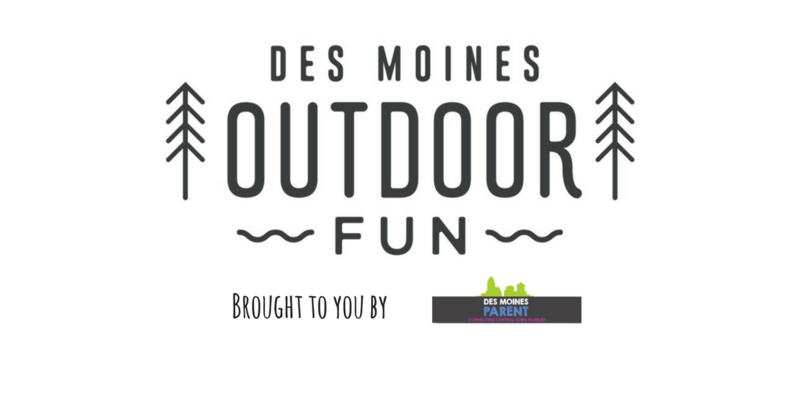 They have kid’s programming and usually at least one hands-on exhibit on top of exploring the plants and seeing the fish pond. Small charge – we are Brenton Arboretum member, which gets us in free! 5. 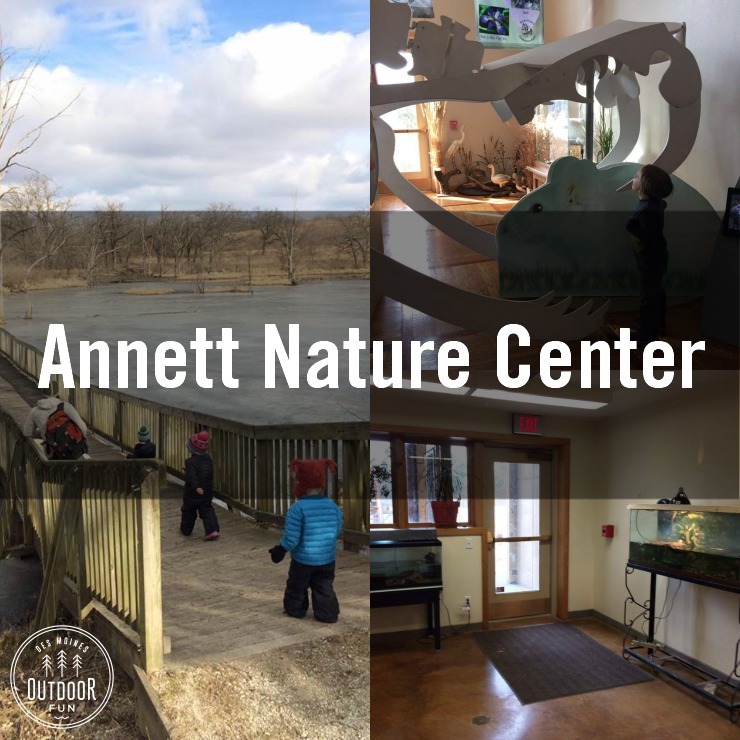 Annett Nature Center- a hidden gem, this little nature center has live animals, educational displays, and hands-on nature toys. Free! Make sure to call before you go; they have regular hours but also only one staff person at a time and may close for programming. 6. Forest Museum/Arboretum- the indoor portions of this museum are small and require outdoor walking in between them, but each of them have hands-on elements mixed in with the things to look at and learn. Free! 7. 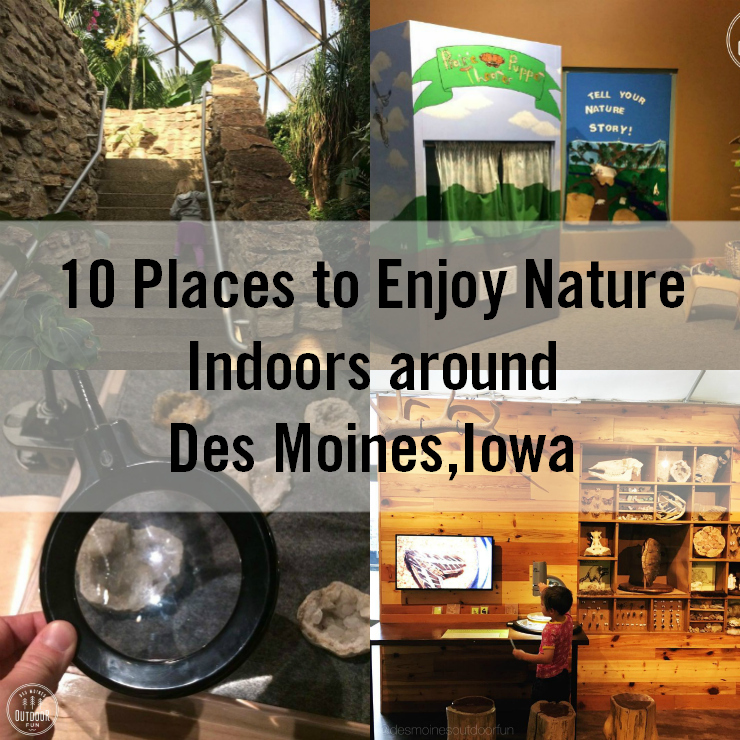 Science Center of Iowa – There is a really cool new nature corner up by the live animals, with collections, a microscope, and lots of nature books. We love the “star room” as well! Admission and parking costs. 8. Bass Pro Shops – I’ll admit I haven’t been to the one in Altoona, but we frequently seek out Bass Pro Shops when traveling because the kids love seeing all the fish and turtles. Free! 9. Reiman Gardens – I really need to get a page up about Reiman Gardens, it is in Ames which doesn’t feel like the Des Moines metro to me, but close enough for an easy visit. 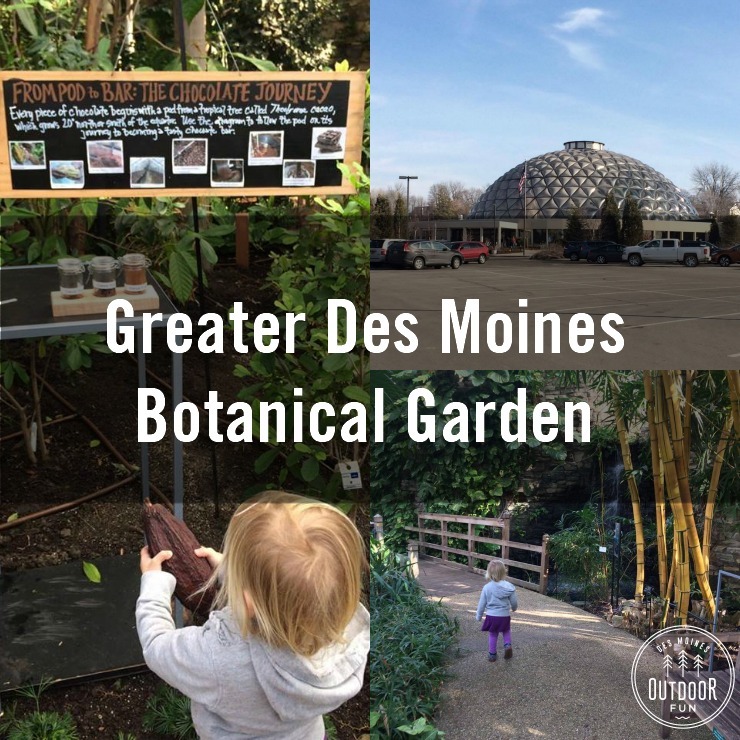 Their indoor portion is smaller than the Des Moines Botanical Center, but they do also have a butterfly room which is highly enjoyed by my kids. Small charge – we are Brenton Arboretum member, which gets us in free! 10. Blank Park Zoo – A friend just told me she didn’t realize there was an indoor portion to the zoo until after visiting several times, so I want to point out that there is! A fun swinging rope bridge, lots of smaller animals to see, and warmer temperatures make this a fun spot to pop in during chilly months. Admission costs. 11. We are adding an EXTRA spot. 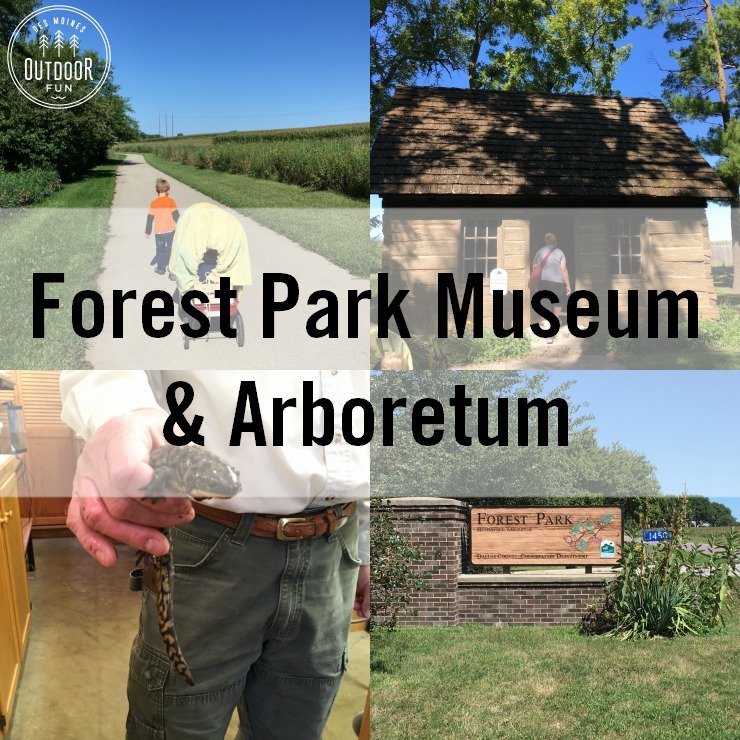 The Jester Park Nature Center opened this past summer and is the perfect place to explore and experience nature indoors. There are tons of fun things to see and do. It is completely free! 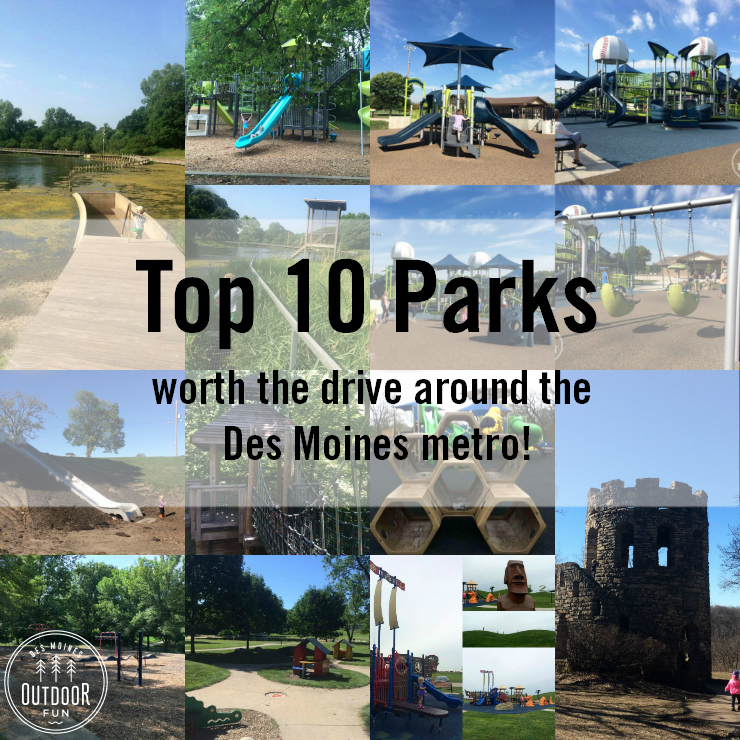 Honorable mention goes out to the new Des Moines Children’s Museum! They don’t have anything truly natural or alive, but they do have a very fun pretend camping play area. 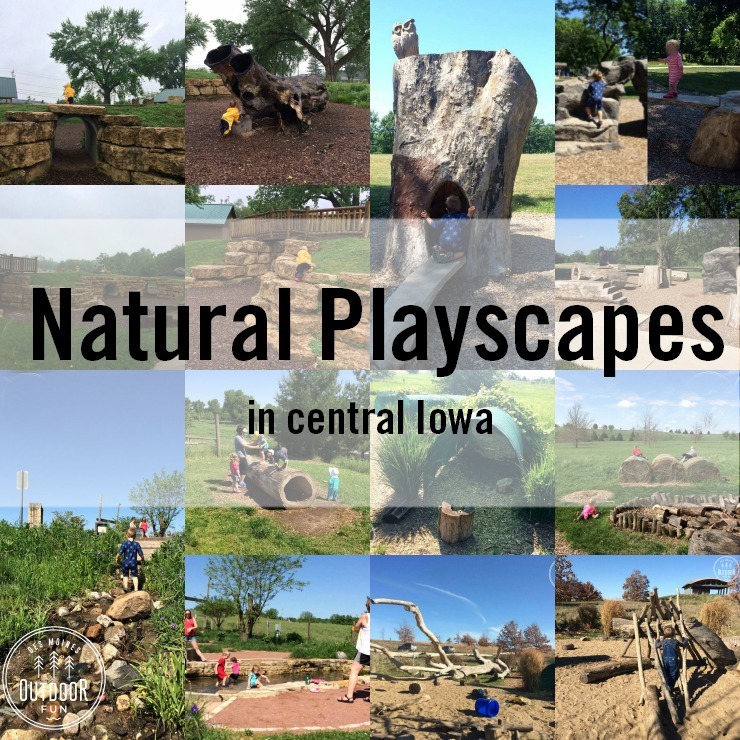 There are also museums/nature centers at Voas Recreation Area, Kuehn Conservation Area, and Pammel Park, but they are only open to the public for programming or sporadic, special occasions.